Hello everyone! I have been meaning to do this review but been so busy dont know what day it is! I had this sent to me by Richard from Skinetica asking if I would review the product and was happy to try this out. My skin is combination, rarely do I get breakouts but when I do they are in one area for weeks and it is so annoying! Lately I have had issues with my skin and have put it down to stress so I used this product every other day after I cleansed my face, it states to repeat it every 12 hours but I kept forgetting in the morning! After a couple of weeks I noticed a difference! 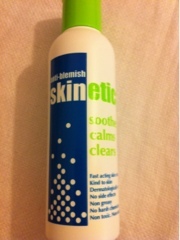 Skinetica states it "soothes, calms and clears" and is "fast acting". The scent reminds me of witch hazel and it soothed my skin when applied, the product doesnt contain harsh chemicals and didnt dry my skin out. I did notice a difference, my blemishes reduced in size and redness, the product didnt get rid of the blemish as such, but prevented it returning as it normally would after a few days. I would repurchase this. 8/10 as it wasnt fast acting as it states but did work after a couple of weeks. Thanks for this review, i'm still searching for the perfect product to redice blemisjes,I definitely have to try thos out!